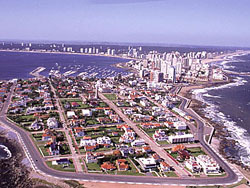 A meeting point for all those arriving in Punta del Este, this avenue concentrates most commercial activities. The street, formerly 4th street, was named after the first mayor of Maldonado, Juan Bautista Gorlero. He was also a keen promoter of Punta del Este as a tourist town. Gorlero begins on 31st street and ends on 15th Street. All kinds of shops and businesses can be found, as well as restaurants, coffee or beer houses, cinemas and shopping arcades. The majority of real estate companies have their offices on Gorlero. The center of town is considered 27th street up to the plaza, and traffic in summertime is very heavy. It is recommended to leave the car on any of the adjacent streets and to reach Gorlero on foot. Beyond Plaza Artigas traffic becomes more tolerable.